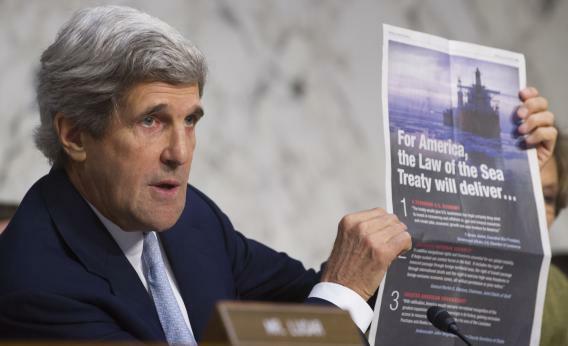 US Senator John Kerry (D-Massachusetts) holds up a newspaper advertisement as US Secretary of State Hillary Clinton, US Secretary of Defense Leon Panetta and General Martin Dempsey, Chairman of the Joint Chiefs of Staff, testify before the US Senate Foreign Relations Committee on the Law of the Sea Convention, during a hearing on Capitol Hill in Washington, DC, May 23, 2012. Kerry will help Obama prepare for among the most consequential events of his reelection campaign — the three fall debates against Romney. As the senior senator from Massachusetts, Kerry has studied Romney’s career and campaign style for nearly two decades and has first-hand knowledge of his record as governor. Kerry has long been considered one of the Democratic Party’s most skilled debaters, and his performances in more than 25 debates in the 2004 race earned plaudits. Some credited his strong debates against President George W. Bush with tightening the race in the closing weeks of the 2004 campaign. It is his perspective on Romney, though, that could be especially valuable for Obama. Kerry was a key surrogate on behalf of the late Sen. Edward M. Kennedy (D-Mass.) when he defeated Romney in 1994. And Kerry closely observed Romney’s successful 2002 gubernatorial campaign, where his performance in debates against Democrat Shannon O’Brien were believed to have helped him win. Kerry and Romney both handle themselves well in debates, referring readily to lots of studies and numbers – numbers that when it comes to the economy, at least, continue to be a hard sell for President Obama. Figuring out a way to highlight what few good indicators there are out there will be a big part of his convicing voters to give him more time in office.